Thankfully, the warm weather has finally arrived – so getting a good cycle in before the hottest part of the day is going to be important from now on – at least until we reach Northern France. Paddy is less enthusiastic about the warmth particularly the hot afternoons – I’m a bit of a sun worshipper though so I’m very happy to be leaving the cold mornings behind. We had easily fallen out of our early rise routine while Andy and Rach cycled with us – not that our early rise routine can ever be considered ‘early’ by most other cycle tourers’ standards. Paddy and I have always enjoyed our 2 hour + morning packdowns… The days are getting longer and longer so we’re not too worried. Nevertheless we will try our best to get going by 9am. Let’s see how we get on! There was quite a hard climb out of Bled town but then we joined back onto the good cycle route and the cycle turned into a manageable steady incline. This continued all the way to the ‘border’ with Italy and by the afternoon we were soon crossing into country number 22. Like Greece, suddenly we were cycling through a country we have both visited lots before – home feels closer than ever! 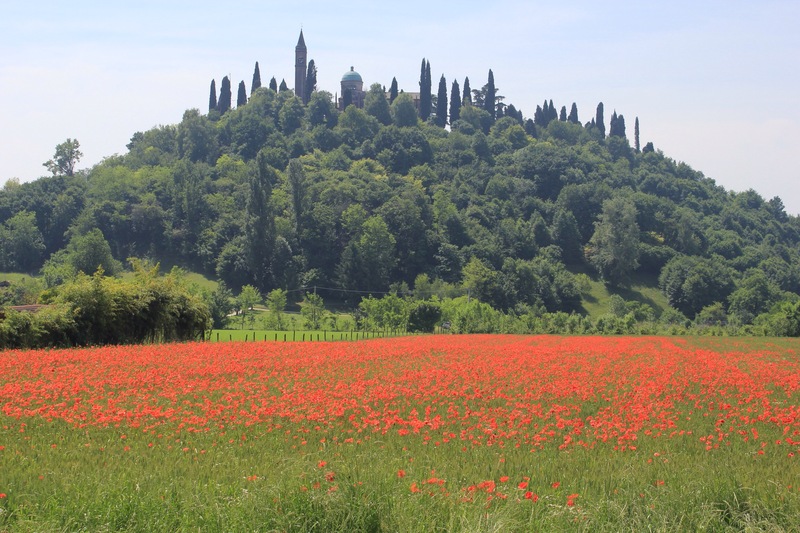 Our route will see us swoop across the top of the country, avoiding any of the big mountains on its northern fridges and making a bee-line across the flat plains to Milan. It’s sad we won’t be doing any cycling in the rest of the country; But with only 10 days until our flight home to Ireland (where we are visiting P’s family for a time) from Milan Bergamo we don’t have much time for many rest days let alone a detour further south… We’ll have to save Tuscany for a short cycle jaunt another time! The great cycle route continued for the rest of the day and well into the next. Taking the place of an old railway line it was blissfully flat and slightly downhill in our favour so we ate up a lot of miles very fast. It was great to be away from the cars and traffic, we enjoyed great views and liked stopping for regular breaks outside all of the beautiful old station houses. We camped in a wooded area between the cycle path and the river that night. Whenever we come to Italy we always quickly remember why Italians are known for their style and dedication to aesthetic. Every town or village we seem to pass through is an idyllic hamlet of pastel coloured houses with painted shutters and cobbled plazas peppered with fountains and elegant classical statues. Every garden is covered in blooming roses and the smell of Jasmin hangs heavy in the air wherever we go. Wine making is big business here and we cycle through miles of vines which must be growing at a rate of a ft a week at the moment. Many of the vineyards stretch across vast fields which often surround a small hill. There is often a beautiful ancient casa perched on top of these hillocks. All the farmers are busy hay making too and we have loved cycling along the wheat fields which are often stained red with wild poppies. It’s all rather idyllic! 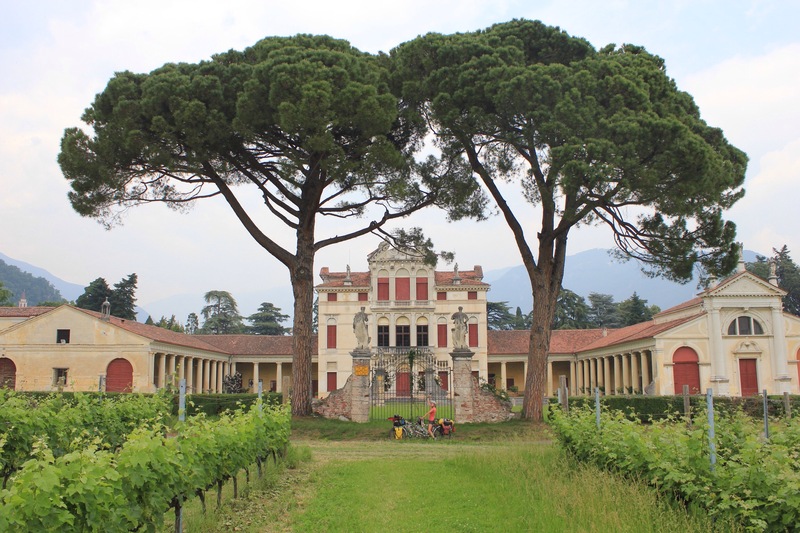 Picnic on stone steps of main square of Venzone – the town was totally flattered in a terrible earthquake in 1976. Along some of our route, houses and gate posts still bare pink ribbons and bows which we assume are left over from the Giro d’italia – Italy’s version of the Tour de France where it’s all about the pink jersey rather than the yellow. It’s been very hot but there has been plenty of chances to cool down in the clear blue rivers. The air has also been very heavy and on our second night we had to endure a crazy flash thunderstorm – we just about got in the tent in time and it’s probably the biggest test our MSR Hubba Hubba has had to cope with so far! From here we wound our way up an impressive gorge towards lago di corlo – a man made reservoir/lake where we would stay in a campsite for the night. Avoiding the main road and tunnel we take a spectacular switch back route up through the valley – the road we took was actually closed with big bollards blocking cars from passing through so we could relax, take our time and enjoy the peaceful climb without worrying about vehicles tearing around the corners. The views were amazing and Paddy got the heeby-jeebies looking down into the gorge below! Half way up we see what looks like a large stone lying in the middle of the road and wonder whether this is why the road had been closed… but as we get closer we realise the object isn’t a stone at all but rather a beautiful adolescent male deer who has clearly played too close to the edge and toppled off from the sheer cliff above. He’s untouched apart from a small trickle of blood flowing from his antlers – it’s definitely the saddest and most majestic ‘road kill’ we’ve come across. We reach the remote hill top village of Incino where we stop to take in the view of the lake and the lush green valley and then make our way over to the campsite. The next morning we enjoy a lazy breakfast by the lake then pack up and get going. 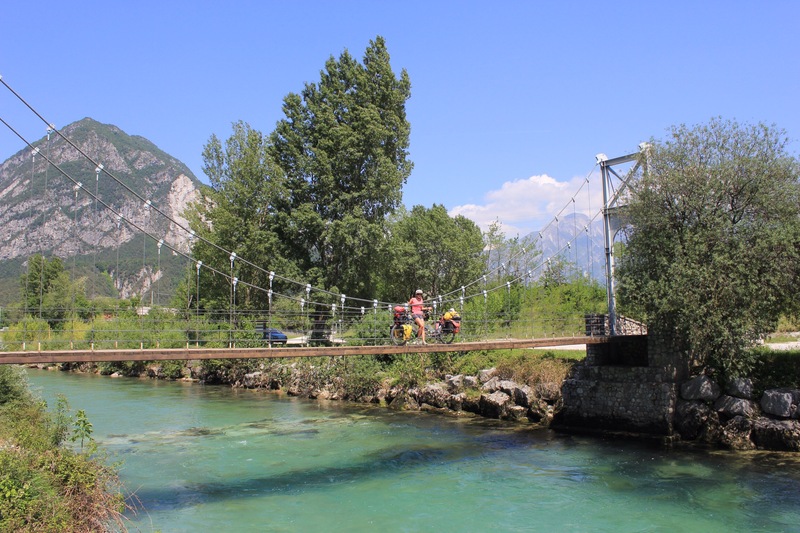 Cycling is big around here and we meet lots of road bikers as we wind our way down another excellent riverside cycle route to Trento, another beautiful town. We’ve made great progress thanks to a strong tail wind and we manage to reach the northern tip of Lake Garda for 6:30pm. The plan is to stay here for at least a few days. We’ve made really good progress and should easily make it to Bergamo. Despite the lake having an almost Mecca like status with sailers all over Europe Paddy has never actually been to Garda… We may even treat ourselves and go sailing! Sorry I haven’t been updating the blog as regularly as normal. We are still well and slowly making our way home but job applications, interviews and house viewing have been getting in the way of my updating the blog. 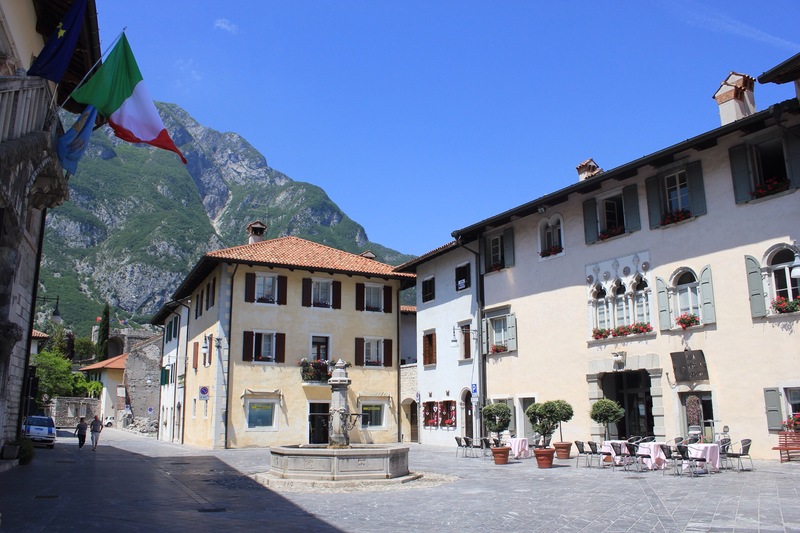 Anyway – here is the start of Italy with some other now soon to follow! We arrived early into Ljublana and luckily were allowed into the apartment we had rented for the night at 11 in the morning. This was good as Annie had some job applications to do (hence some slackness on the blogging recently!) and we got to unpack and shower in preparation for the arrival of our good friends Andy and Rachel from London who would spend a week cycling with us. With Annie tucked up in the appartment I went to explore Ljublana. I took a walk up to the old castle and looped around by the river which was packed with people drinking and eating icecreams in the sun. It is a small but very pleasant city and I found an interesting free photography exhibition in the old town hall. That night we had dinner in the appartment and waited up until 11pm for the guys to arrive. The next morning Andy n Rach went and got their bikes and panniers and we loaded up. It was very exciting to have our friends along on the tour! We set off northwards out of town using the extensive and excellent cycle lane system that is prevelant throughout Slovenia. Usually we spurn cycle lanes: they tend to have a poor surface, pedestrians, parked cars and almost always end abruptly leaving you up on a curb somewhere. But these were excellent and made the cycle out of town very easy. Winding up a valley on day one. Lovely to have some friends along. Our planned route was to head north to Skofja Loka, then hit Tolmin and loop aoround to Kranjska Gora ending up in Bled. We were extremely lucky with the weather as the guys seem to have brought the start of summer with them, we have cloudy mornings typically but the sun is now so strong it burns these off in the afternoons. First stop was for a big shop in Hofer, (Aldi under a different brand). We load up on provisions and resume cycling which becomes very pleasant as we weave down country lanes, past pristene gardens and huge piles of wood. We get to chat to Andy n Rach and they seem to enjoy the cycling so far! We stop for lunch in a field and roll out our standard spread for the guys… all going very well until a farmer pulls up with a lorry load of slurry to dump right where we are sitting… lots of smiles and we decide to move on. We got to Skofjka Loka in the afternoon and did a bit of back and forward cycling deciding which fork in the road would be quiter. We ended up going the northern road which was NOT a two lane motorway. This gave us a look around the medieval old town which was worth a visit. In the late afternoon we stop to introduce the guys to our ‘well deserved beers’ tradition. It goes well and we decide to wild camp that night in a meadow off the road. The following morning we pack up slowly in order to dry out the tents from a heavy dew, a pattern for the week. We cover a much shorter distance this day with many photo stops, particularly past Tolmin where we link up with the Socca river. During a downhill section we do some bike swapping with some interesting results…I spend some time on the back on the tandem with Andy driving which is terrifying! Annie loves the single bike but needs a fatherly push start to get it going. Maybe we will do some single bike touring in the future but we are all happier back in our chosen steeds for now. That night we head to a campsite right on the river, I go for a paddle and discover the water is icy cold: not good for swimming but good for chilling beer. After another slow morning and a good breakfast and we find ourselve cycling up the Socca valley and the scenery just gets better and better as the day goes on. The river is busy with canoes and fly fishermen. We stop at the Kozjak waterfall along the way which is pretty impressive. We enjoy cycling with two single bikes, but like other time we have done this we find some differences in speeds. Uphill Rach n Andy glide past the lumbering tandem, but on the flat and downhill we can power through. This means some stopping and waiting for people and during one stop we meet some very unfriendly policemen. Apparently we weren’t off the road enough and we got the full death stare and oir detail written in a little book. We have met a lot of police and military people on the road and these two were easily the most unfriendly, maybe they were having a bad day or missed the class in manners at the police academy. After our minor altercation I decide we should navigate off the main road and over a little bridge on my map which will take us to a camp site for the evening… Annie calls this a typical ‘Paddy navigation’ expedition as we end up pushing the bikes though narrow forest paths and over two extremely wobbly suspension bridges. We make it to the campsite and that night the guys generously buy us a hearty dinner of Schnitzel and chips! We are close to austria now and German tourists are common here and we ofter are greeted in Deutch. We know the following day we have our big climb over the Vrisik pass so we get and early night. An early start the next day and we pedal up the Socca valley the scenery really is stunning, as good as anything we have seen on the trip and a nice smooth road to cycle on. The valley starts to kick up and the cycling is slower, we find the last shop before the climb and stock up food including our staples of fruit and chocolate spread but not the local cheese despite the hard sell from the friendly shopkeeper. At this stop I casually check what the incline for the climb to Vrisik pass will be. I am shocked and need to double check… the incline is 9% average over 9km. Translated to: extremely, extremely steep! Oops! I secretly worry that we all might struggle to get up since we typically consider anything over 6% very hard and we are fully loaded up! After a quick lunch we approach the climb and I tell Annie about the challenge ahead. ‘Lets just see how we go’. ‘OK’. As we start the ascent we all settle into some kind of rythem in order to deal with the challenge. Andy ‘Chris Froome’ Bailey has no problems zipping up as fast as he likes, he is lightly loaded on a good touring bike. The real hero is Rachel ‘Nairo Quintana’ Jones who is on a ‘womens tourer’ style bike which is heavey and lacks anything like suitable gears for a climb like this. Rach does 3-4 minute bursts pumping the pedals around out of the saddle, then stopping to catch her breath. She is still a lot faster than the lumbering tandem as we grind it out doing about 4.5km/hr and stopping every 20 minutes. 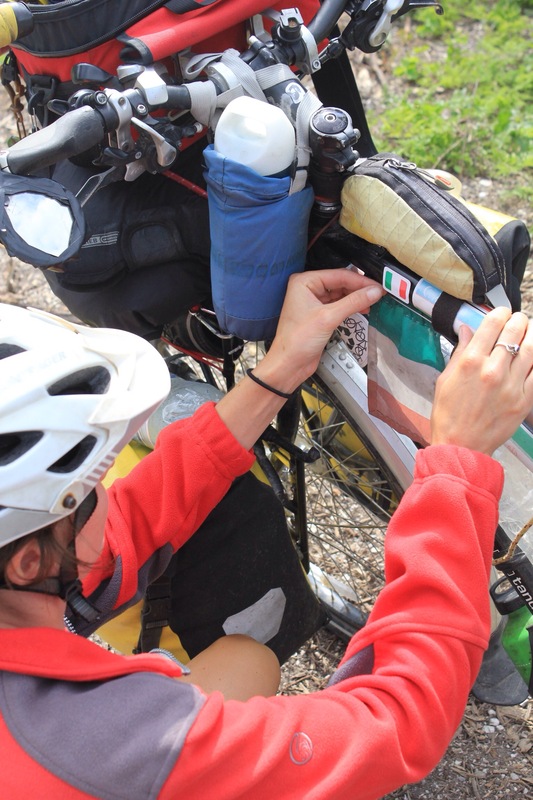 This all continues on and off for aboit 3 hours – the joys of cycle touring! Andy and Rach get a taste for what we have experienced for the past year as half way up we meet a group of american tourists shocked at our ‘madness’ of climbing such a pass. It is not madness, just one km at a time! But the rewards of such big climbs are evident in the spectacular views and sense of achievement. We are all on a big high at the top and enjoy a stunning decent into Kranjska Gora. We attempt a wild camping spot that night, but eventually decide a fine from the police is not worth the risk (we are still in the national park), so we proceed down the valley to ‘Camp Spik’. The next day is a slow start since it is just 30km to Bled from here. After a long slow morning we follow a gorgeois route down to Bled (except for one punishing and unexpect climb). We go straight to camp Bled and Andy heads off to buy beers and wine for a celebratory eveing with sausage casserole. The next morning we dine on pancakes which might become a new staple for us on the camping stove. For our final day in Bled we have a B&B booked which we go straight to after the guys drop off their bikes. We go for a weaving hike up above the lake and that evening feel very sleepy and decide to go get some pizza and beer in Bled. On a little walk down to a cash machine Annie and I spot a big stage by the lake a band doing a sound check….hmmm. This turns out to be a top notch Beatles tribute band which we sing along to all night against the stunning lakeside setting. A perfect ending to a great week with the guys. 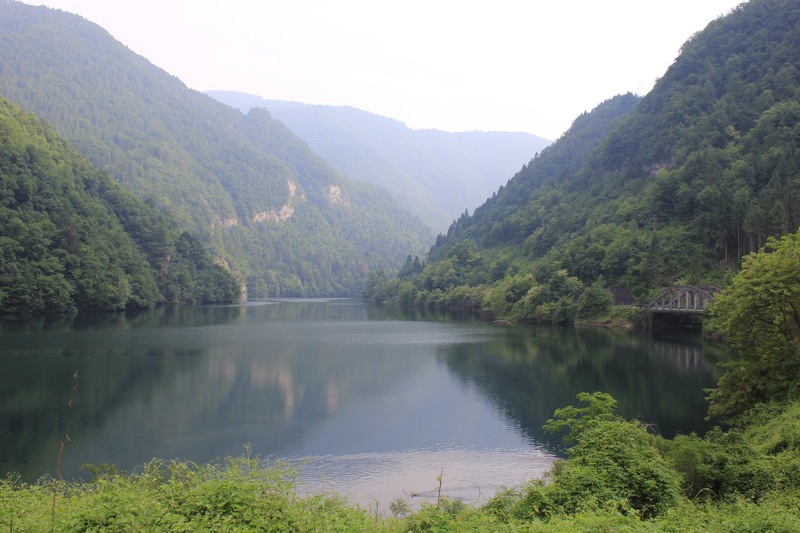 Slovenia – Country Number 21!! We now had a week to kill before meeting up with our good friends from London, Andy and Rach, who were coming out to join us for a bit of cycling in the north around lake Bled. So we hatched a plan to wind our way up through the east of the country for a bit and meet them in the capital Ljubljana on Sunday. We were in dire need of re-charging all our electronics and neither of us had had a hot shower since Sarajevo (2 weeks) so we had a look to see what warm showers hosts there might be on our route. There was one who instantly caught our eye – Noel Fitzpatrick. ‘He has to be Irish’ Paddy said, so we got in contact. Noel was indeed originally from Ireland and him and his lovely wife Gilly (who is originally from the north of England), got back straight away and told us we were very welcome but they’d be away skiing until late. We were welcome to find their house, let ourselves in and help ourselves to a shower and the washing machine though. They also invited us to eat as many eggs from their chickens as we could and were told there were beers cooling in the fridge. Although we’ve become accustomed to this kind of unquestionable hospitality and trust, we still never take it for granted – here was a couple who were willing to leave a key for two complete strangers. Gilly and Noel live in a very picturesque village called Drasici which is famous for it’s wine making. The village sits on a hilltop right on the Slovenia-Croatian border and the whole area is covered in grapevines. What’s interesting about Drasici is that the wine is made through a collective effort, with lots of families and farmers contributing their harvests to the central wine press which is situated in an old cellar near the village church. We had been instructed by Noel to find this church from where he’d given us directions to the house. We parked up and started our search but we were soon accosted by a group of locals who were sitting outside the aforementioned wine cellar. They waved us down, offered us a seat and placed a glass of crisp, chilled white wine in each of our hands. A huge plate of local cheese and cured meats soon followed. It was a nice welcome! We spent a lovely hour with this group of locals who were celebrating St Florian day – the patron saint of fire fighters. It’s customary for the women to take a day off on and let the men cook instead! The wine and the platter of cheese and meat were the fruits of their efforts! Here are the group signing the traditional Drasici wine song. This encounter meant we were settled at the house for ﻿less than half an hour before Gilly and Noel returned home themselves from skiing with their two kids. We couldnt have felt more welcomed and when we met they made us feel as if we were being greeted by longstanding friends. The next few days were spent being part of the Fitzpatrick household. We had such a lovely time with the four of them, bashing out classic 90s rock songs and playing SuperMario cart with the kids, going for long rambling walks in the evenings and talking politics over dinner that we kept delaying our departure. It wasn’t until Thursday that we set off again. May is an important celebratory month for Slovenia and for the duration of the month every village and town erects a huge May pole. These are different from the May poles we know. These are enormous pine trees, stripped of their bark and pine needles apart from a decorated Christmas tree-like bush at the top. As far as we know they don’t dance around them either. The countryside has been lovely but I think we have the best of Slovenia still to come. We’ve heard the north is supposed to be beautiful. We easily find wild camping spots including a lovely one in this wooded area near a reservoir. 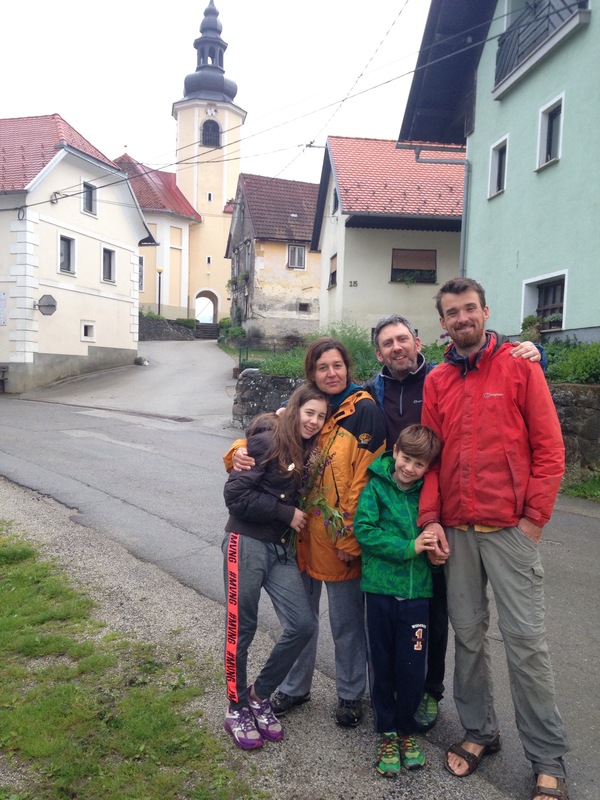 We easily reach Ljubljana and find the apartment we have booked with Andy and Rach. Now we were out of Bosnia it was time to re-enter Croatia again. 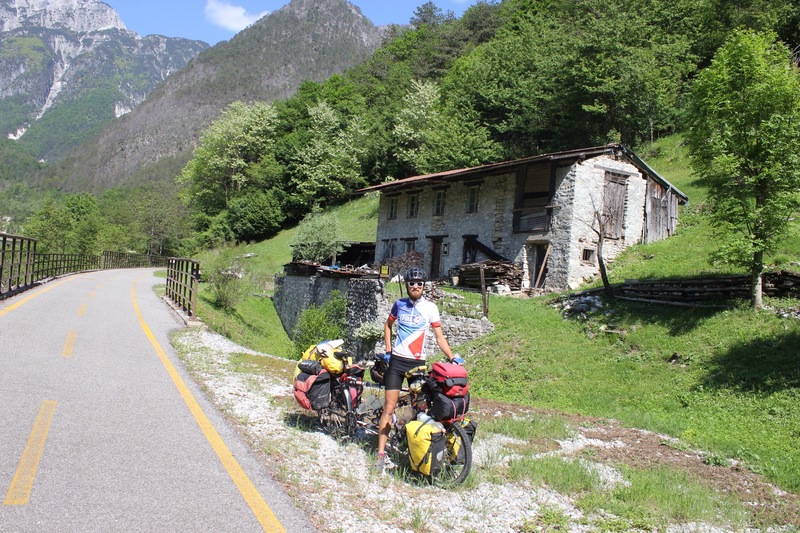 It wouldn’t be for long – just a few days cycle before crossing into country number 21 – Slovenia. Croatia, I think it’s fair to say, is a country which has become the next big destination for the established western (and eastern) tourist scene. About 15 years ago it might have featured on the intrepid travellers’ ‘eastern block’ list – safe but still developing – but since joining the EU in 2013 the country’s tourist industry has exploded and Croatia’s hidden charms are now eagerly being rediscovered. It’s easy to understand why, Croatia has a lot to offer, with beautiful coastline, sandy island beaches, picturesque inland lakes and impressive Austro-Hungarian 19th century castles. We had a nice cycle through the middle following a route which saw us cross at Bihac and wind up through Slunj and Generalski Stol. The biggest thing we have noticed here is that it’s really the first country where most people have had gardens as we know them – nice lawns with flower beds surrounded by fences or trees; well kept gardens with animal figurines and matching furniture. All the houses are very neat and well kept too. This seems like a strange thing to comment on but we think its probably quite telling; people seem to have more disposable income here. Although it’s in the EU, like the UK, Croatia has retained its original currency – the Kuna. There is roughly 7 kuna to each £1 – it will be our last unfamiliar foreign currency of the trip! As we move further west, each country is becoming more and more expensive. We have found it relatively easy to keep to our budget up to now but Croatia is likely to be be the first big test. We take a nice half day off to visit Plitvicka National Park – an amazing wildlife sanctuary made up of a series of forest-clad Jazeras (or lakes) which flow into each other via hundreds of waterfalls. It’s very touristy and pricy with set routes to follow through the waterways. We were looking forward to an afternoon where we didn’t have to think too much, where we could just enjoy being off the bike. We thoroughly enjoyed the 3 hour walk, the park is beautiful and really nicely done – the pathways actually allow you to twist and turn through the lakes and even down the waterfalls. We also had great weather for the walk which was fortunate as rain was due that afternoon. We didn’t stray far from the park and found a great hidden camp-spot in the woods off the road. We get set up and see another big deer casually walk past us as we’re eating our curry. Heavy rain falls overnight but the surrounding beech trees provide plenty of cover. The next day the weather feels like it doesn’t know what it wants to do with sunny spells one minute and torrential downpours the next. Paddy navigates a nice cycle through the quieter roads up to and we manage to find an undercover picnic area to hide from the overnight downpours. We’ve done well not to lose any items thus far in 2017 but in Croatia this all broke down; firstly with some git taking my winter cycling gloves from where I had left them momentarily in a carpark to then us managing to leave my sunglasses one day and our thermos the next on the roadside after a quick stop. These last two things we managed to retrieve but only after retracing our route 40km back… Doh! We left the rain behind us on the last day and had sunshine to the border this will be our last passport control crossing as Slovenia, Italy and France are all Schengen countries.